Lowman is the founder and president of BEYOND LIMITS: Awaken Your Potential, a 501C3 nonprofit that believes in using challenge as a chance to extraordinary. On July 14, 2015, she and a diverse group of 16 volunteers hiked the summit of Mount Katahdin, a feat made more complicated by the fact that Lowman cannot walk. Using a modified “PiggyBackPack” carrier, the hikers carried her to the top of Katahdin. Along the way the team realized that their greatest accomplishment was not reaching the summit, but working together to prove that there is no such thing as “can’t.” Lowman left that expedition knowing that she wanted the next BEYOND LIMITS adventure to be bigger and better. She decided that since the group had hiked Katahdin, the northern terminus of the AT, why not hike the entire trail from Georgia to Maine? 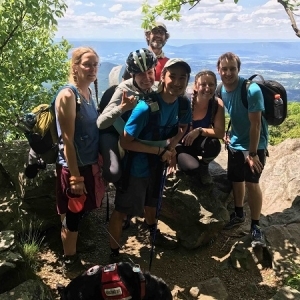 With the help of her Professional Communication students and fellow BEYOND LIMITS team members, Lowman began a yearlong effort to plan, coordinate, and recruit volunteers for her first AT thru-hike. In mid-March, Lowman drove to Springer Mountain, Georgia, the southern terminus of the AT, and began hiking with four students from Clemson University and Sean Williams, a professor from the university, on March 20. None of the students were experienced hikers nor had they met before joining the hike. The group hiked a total of 30 miles during their week in Georgia and took turns carrying Lowman in the JacPack, a new and improved version of the PiggyBackPack. They endured many challenges, including a hailstorm and the often cold weather conditions of the Georgia mountains, but formed strong bonds with each other and greater physical and emotional resilience. Although Lowman’s initial goal was to thru-hike the entire AT with a team of rotating hikers, she had not been able to recruit hikers for after the first week. She could have easily given up, but instead she went to Clemson University in Clemson, South Carolina in hopes of promoting BEYOND LIMITS and recruiting people to join her on section hikes throughout the summer. While in Clemson, she met with university and community groups and later travelled to Roanoke, Virginia and gave a presentation at Virginia Tech. 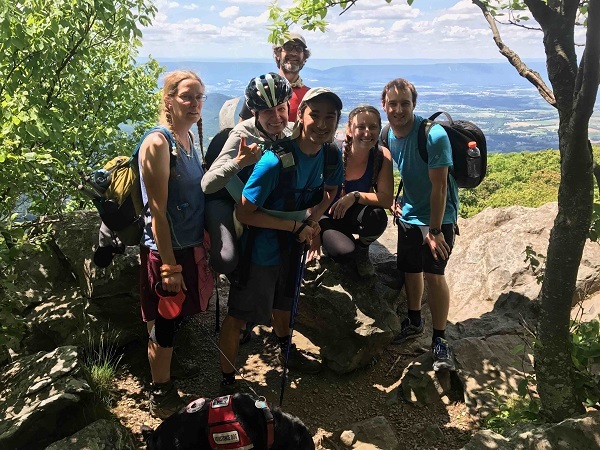 On May 31, Lowman arrived at Shenandoah National Park in Virginia after having recruited another team for a hike from June 1-10. She had been in touch with Mike Gowen, a professor from Murray State University in Kentucky, who recruited one of his students from New Jersey. That student convinced a friend from New Jersey to join. The group, which also included a student from Unity College in Maine and Lowman’s hiking partner Hopper Hanavan (Hanavan also hiked with Lowman in Georgia), did a form of hiking known as “slackpacking.” They carried day packs with food and water while a driver brought the heavier equipment to each campground. While hiking, the group used the JacPack to carry Lowman and she used a hiking wheelchair at the campgrounds. They worked up to hiking 10 miles per day. Lowman said that the AT was a great place for the latest BEYOND LIMITS expedition because being the longest foot-only trail in the world brings more potential for spreading a message of teamwork and empowerment. Along the way, the hiking teams have met many people who have been both awed by their success and inspired to overcome whatever physical and emotional challenges they might face. She views the AT hikes as victories not because the hikers completed their sections of the trail but because of the friendships they have formed and their commitment to going beyond their own perceived limits. In the months following that Virginia hike, Lowman has embarked on more trips to recruit people for future hikes. In August, she attended the Appalachian Trail Conservancy’s biennial conference at Colby College in Waterville, where she set up a display for BEYOND LIMITS and talked with people who were interested in getting involved. In September, she attended a presentation that Sierra Costa-Pierce, one of the Shenandoah hikers, put on as a culmination of a BEYOND LIMITS-related project he completed as a Unity college student. In October, Lowman presented at the Appalachian Long Distance Hikers Association’s annual Gathering in Abingdon, Virginia. She also traveled to western Kentucky for a week of presentations and a little hiking, and to George Mason University in Harrisonburg, Virginia, for two other talks. She has plans to return to Murray State University in March and hike with a group of primarily Murray State students on a trail called the North-South in Land Between the Lakes, Kentucky. In addition she is doing some training with members of the Katahdin group with the hope of hiking a section of the AT in Maine this summer. She plans to do section hikes of the AT every summer for as long as she can. During her journey, many people have expressed sympathy because Lowman was not able to hike the AT as originally planned, but she does not view the adventure as a failure. She realized early on that due to the physical challenges of carrying her on the JacPack, hikers would not be able to walk the 20 miles a day necessary to complete such a hike. But, instead of going home, she used those setbacks as an opportunity to visit communities and connect with people through the BEYOND LIMITS story. She said that what has happened on the AT is not much different than what many hikers experience. She has remained flexible and willing to adapt to changes as they occur. Lowman encourages people to get involved with BEYOND LIMITS in any way they can. Though many people have completed sections of the AT with her, hiking is not the only option. People can help simply by following her blogs on http://beyondlimitsawaken.org/ and the nonprofit’s Facebook page, https://www.facebook.com/BEYONDLIMITSAwaken. Anyone who is interested in volunteering or would like more information about BEYOND LIMITS can contact Lowman at jacquelyn.lowman@maine.edu.